What is the core difference between an online store and a physical store around the corner in the way they attract customers? Yes, you are right, with a physical store, usually, it is enough to locate in a crowded place. Search engine optimization, PPC, crowd marketing and other activities – this is how online retailers attract buyers. 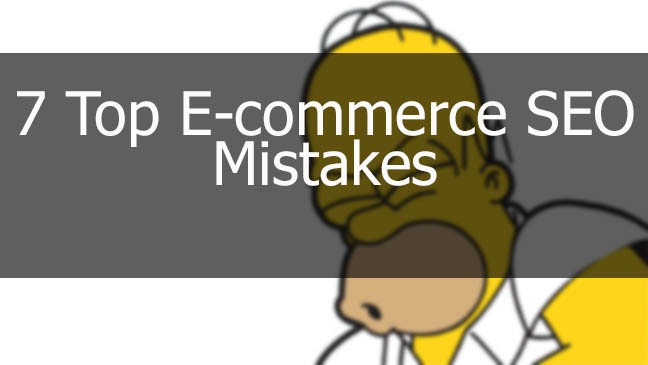 I have audited many e-commerce websites and know the most common SEO issues they have. Today I will share my experience with you. I will list those issues and will let you know how to fix them. This issue is most common with the companies that have a physical store and then built an online version of it. Let’s face it, for many people having a website is just cool and nothing more. They sleep peacefully, they are proud they have a website – everything looks great. Why even bother about link building? They usually start thinking about SEO, when the number of sales decreases. Solution: I began with a simple one and the solution is simple. You need to start earning links to your website because backlinks are still a core ranking factor. If backlinks are the most important external ranking factor, then page title tag is one of the most important elements of on-page optimization. You can skyrocket your rankings in a week or so, once correct title tag optimization is implemented and indexed by search engines. Solution: Do keyword research to find popular search phrases and make sure they are present in the title tag of the pages. Keep in mind that long-tail keywords have the best conversion rates. This is the only reason why it is something you must do. Duplicate content means a penalty, that’s it! Lots of websites copy the product description right from the manufacturers’ websites. Why bother writing unique ones? I have thousands of good and writing costs money. If you are not ready to add unique content, then SEO is not the right strategy for you. Solution: Hire cheap content writers to write short descriptions of your products. As a rule, it is simple writing and hiring an army of students will not cost you much. Expert blog posts, white papers and case studies, no doubt, must be written by established professionals. Fortunately, I seldom come across such issue. However this one is really harmful to rankings, so I am listing it here, in my post. As a rule, such issue occurs with e-commerce site engines created by self-proclaimed coding superstars who often know nothing about modern SEO. Solution: Define all the SEO issues your e-commerce software generates and try to eliminate it. Pay special attention to category, filter pages or any other pages that provide custom experience for your visitors. Remember that you should feed Google with static pages. Having lots of internal duplicate pages might get you into a trouble. Schema markup is one of the powerful and one of the least used SEO assets. It is a so-called semantic dictionary (accepted by all major search engines) that helps search engines learn more about your content nature and provide more insightful results for the Internet surfers. Solution: Choose the rich snippet type and implement it on the pages of your website. Here are the types you may consider: paid product search, videos and images, product availability, review and ratings, product name and price and limited-time offers. I would recommend using Review and Ratings; they add yellow stars to the snippet which visually stand your page out. Slow websites have lower conversion rates than they could if there were fast because most of the users are not willing to wait for the page to load. As a rule, you should aim at 2 seconds, this is the optimal time from the user perspective. It should be noted that low site load speed maybe the reasons for lower rankings on Google. Yes, it is another ranking factor today. Solution: Go to Google’s PageSpeed Insight tool and get your data. Show it to your technical team and ask them to fix the issues. Most common speed issues are huge images, no cashing or compression and to many redirects placed. I have never thought this can be an issue but this is really what one of my clients did. He removed items that will no longer be available. For instance, these can be certain smartphone models that are no longer manufactured or whatever you don’t sell anymore. Solution: Don’t remove items even if the product will never be available again because those pages might have earned some backlinks. Another reason is that you make your website thinner, which is not recommended. If you still have to remove items, consider setting up a 301 redirect to the most relevant page of the store (or to the homepage). E-commerce SEO is hard, especially in terms of link building, but fixing some of the issues mentioned above will bring results in a couple of weeks. If you have any questions or you are willing to share your experience, please do it in the comments section. Great tips Vaibhav. I agree with you that page title tag is a very important element of SEO and people should really pay more attention to it. Thanks for sharing some valuable tips, Actually I was looking for the same and I’m satisfied this post as it will help me a lot to save myself.